↑ "Don't Call It Frisco". San Francisco Examiner, San Francisco Chronicle. April 3, 1918. p. 6. Retrieved July 11, 2011. ↑ Although many residents still maintain that the nickname "Frisco" is taboo, many residents, especially younger and working-class natives, have kept the term alive and well. In any case, this is a matter of ongoing debate that reflects certain cultural divisions within The City. Sullivan, James (October 14, 2003). "Frisco, that once-verboten term for the city by the bay, is making a comeback among the young and hip. Herb Caen is spinning at warp speed". San Francisco Chronicle. p. D-1. Retrieved June 12, 2008. ↑ Some tourists refer to San Francisco as "Frisco." However, locals discourage this. Samuel D. Cohen writes that many credit "Friscophobia" to newspaper columnist Herb Caen, whose first book, published in 1953, was "Don't Call it Frisco" after a 1918 newspaper article of the same name. Caen was considered by many to be the recognized authority on what was, and what was not, beneath the city's dignity, and to him, Frisco was intolerable. Cohen, Sam (September 11, 1997). "Locals know best: only tourists call it 'Frisco'". Golden Gater Online. San Francisco State University. Retrieved July 13, 2008. ↑ "PPIE: The City That Knows How". Amusing America. San Francisco Public Library. March 29, 2005. Retrieved June 14, 2008. ↑ Caen, Herb (1949). Baghdad-by-the-Bay. Garden City, New York: Doubleday. ISBN 978-0-89174-047-6. OCLC 31060237. LC F869.S3 C12. ↑ "The City". UnknownWW2InColor. UnknownWW2InColor (Ramano-Archives). 1939. Retrieved June 5, 2009. ↑ "San Francisco: Government". 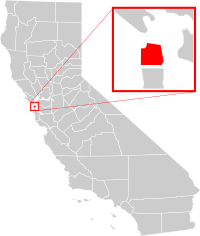 SFGov.org. Retrieved March 8, 2012. San Francisco was incorporated as a City on April 15th, 1850 by act of the Legislature. ↑ أ ب "GCT-PH1 – Population, Housing Units, Area, and Density: 2010 – County – Census Tract". 2010 United States Census Summary File 1. United States Census Bureau. Retrieved July 11, 2011. ↑ "GCT-PL2 – Population and Housing Occupancy Status: 2010 – United States – Combined Statistical Area with Metropolitan and Micropolitan Statistical Area Components; and for Puerto Rico". 2010 United States Census Summary File 1. United States Census Bureau. Retrieved July 11, 2011. الصفحه دى اتعدلت اخر مره فى 18 ابريل 2018,‏ 06:49.